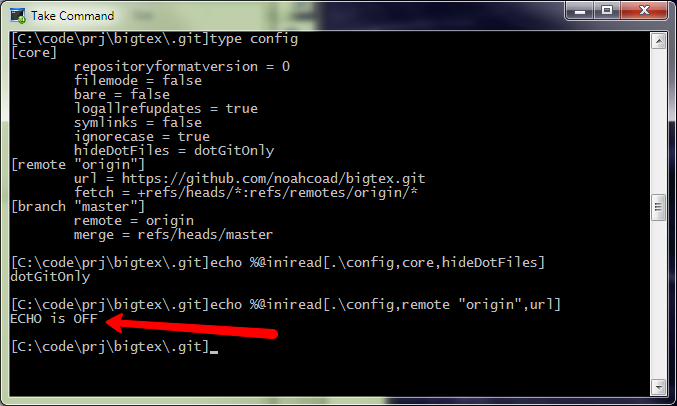 I'm trying to read a git config file which has a section [remote "origin"] w @iniread without success. I may just be doing something wrong. How high is your kludge tolerance? I have no idea why, but TCC is removing **all** quotes! That, I can understand. But I would expect escaped quotes, or %=Q, to make it through. I can't think of a situation in which I'd want to remove all quotation marks from a string. BTW, if you escape them, they're removed and the escape characters remain. Thanks for the workaround Charles. It would be nice of course to use the @iniread function, but that unblocks me.